[feel free to contact @ 9444020663.9444884447] 600 Tones (21 Indian) and 195 Rhythms (26 Indian) 61 keys with Touch Response, 48 Polyphony 600 Tones (21 Indian) and 195 Rhythms (26 Indian) USB devise terminal Indian Tones Indian Rhythms Sitar , Tanpura , Harmonium , Santur , Sarod , Sarangi , Veena , Shanai, Bansuri, Pungi, Tabla Bhangra, Dadra, Garba, Keharwa, Dandiya, Teen Taal, Bhajan, Jhap Taal, Rupak, Indian Pop 1, Indian Pop 2, Indian Pop 3, Indian Pop 4, Ektal, Chautal, Dhamar, Tamil, Rajasthani, Goan, Qawwali, Kerala, Keharwa Tanpura & Tabla, Dadra Tanpura & Tabla, Teen Taal Tanpura & Tabla, Rupak Tanpura & Tabla, Deepchandi Tanpura & Tabla. 57 SFX voices including animal, nature and theatrical sounds along with religious sound like-Shankh and Temple Bell Rain, Seashore, Thunder, Wind, Bubble, Bird, Cat, Rooster, Cow, Dog, Donkey, Elephant, Goat, Horse, Horse Gallop, Lion, Nightingale, Peacock, Applause, Footsteps, Heartbeat, Child Crying, Child Laughing, Man Laughing, Punch, Scream, Roller Coaster, Bike Vroom, Car Passing, Car Crash, Car Engine Ignition, Car Horn, Jet Plane, Submarine, Car Tires Squeal, Train, Buzzer, Coin, Scratch, Shankh, Clock Tick- Tock, Whistle 1, Whistle 2, Whistle 3, Ambulance Siren, Blast, Bar Chimes, Doorbell, Door Slam, Door Squeak, Firework, Gunshot, Machine Gun, Police Siren, Telephone Call, Telephone Ring, Temple Bell. 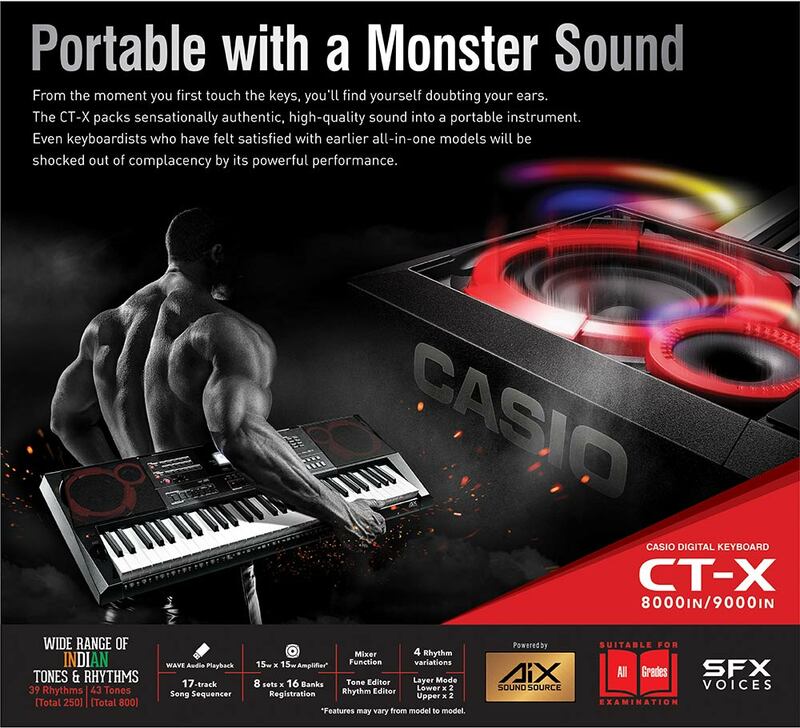 The CT-X Series comes with the AiX Sound Source, which can produce a wide range of sound qualities from powerful bass tones to clear high tones. The exceptional computing power of the high performance LSI reproduces the natural charm of acoustic instrument sounds, such as the agreeable change in tone when a piano key is struck, the sensation of a drum performance, or soaring strings. AiX Sound Source delivers High Quality Tones and Rich Expressiveness The high-speed digital signal processor is also applied for each sound type, such as melody, backing drum and bass, or organ. 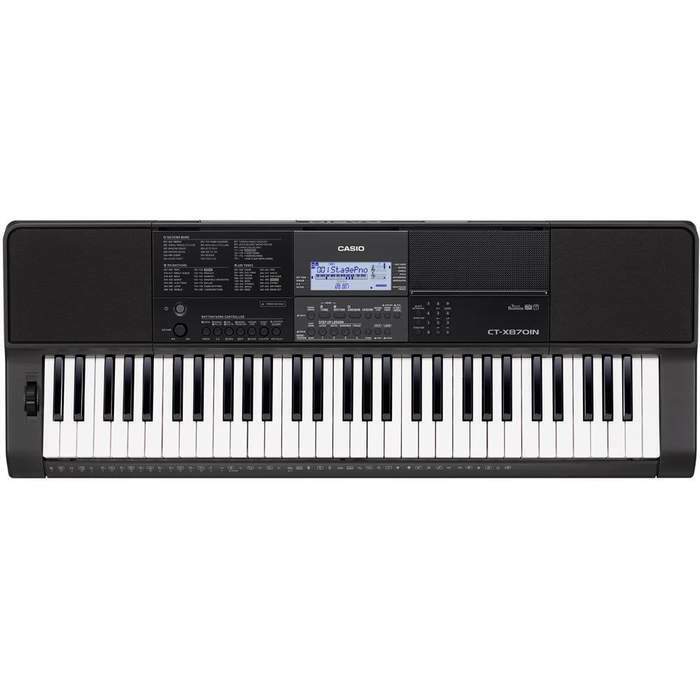 Even the standard ensemble for a keyboard delivers distinct sound for each instrument for an expressive performance.